ASBURY PARK, NJ – On Tuesday, Oct. 27, Monmouth County Clerk Christine Hanlon announced ‘Honoring our Heroes,’ a new military appreciation program, that will provide a way for local businesses to honor Veterans and help Monmouth County Veterans save money. Inside the 36-page guidebook is a listing of stores, restaurants and other businesses throughout Monmouth County committed to offering products and/or service discounts to Veterans. Businesses will also be listed on the County Clerk’s website. Hanlon is hoping more businesses will now sign on to the program. 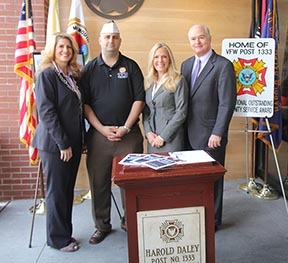 “Participating businesses are receiving specially designed window clings, donated by members of the Asbury Park VFW Harold Daley Post 1333, for placement in their establishments,” said Hanlon. In connection with the announcement, the first two Asbury Park establishments committed to join the ‘Honoring our Heroes’ program, Taka and Purple Glaze. The announcement was made at Taka restaurant at 660 Cookman Ave. Purple Glaze is an artisan donut shop at 516 Summerfield Ave.
Hanlon and County Freeholder John P. Curley personally thanked Taka owners William “Bill” Kessler, David Martocci, Takahiro “Taka” Hirai, General Manager Adam Broussel and Jacki Sharpe, owner of Purple Glaze, for their support of the program. Members of the nationally-recognized Veterans of Foreign Wars Harold Daley Post 1333 Headquarters based in Asbury Park, members of the Asbury Park Chamber of Commerce, Freeholder Deputy Director Serena DiMaso, Assemblywoman Mary Pat Angelini and Assemblywoman Caroline Casagrande were also on hand for the announcement. To join the ‘Honoring our Heroes’ program, business owners in Monmouth County should contact the Monmouth County Clerk’s Office in Freehold with the name of the business, address, phone number and type and amount of discount being offered to Veterans who show a Veterans ID card issued by the Monmouth County Clerk’s Office. The Monmouth County Clerk's Office and Monmouth County Connection issue Veterans’ identification cards (Veteran’s ID cards) to veterans who are residents of Monmouth County and who served our country in active military duty. “Getting a Veteran’s ID card is fast and easy, and there is no cost,” said Hanlon. Veterans must bring in a NJ Driver’s License and ORIGINAL DD-214 “Report of Separation” to the County Clerk’s Freehold office or the Neptune Monmouth County Connection. A photocopy of the DD-214 will not be accepted; it must be an original DD-214. Information about how to replace a DD-214 may be obtained by calling 866-272-6272 or by going online to https://vetrecs.archives.gov. The Monmouth County Clerk’s Office only issues Veteran’s ID cards to Monmouth County residents. If you live in another county, please contact the Clerk in that county. The “Honoring our Heroes” window clings were designed by Natalie Syracuse of Syracuse Signs, Neptune Township. Syracuse is a board member of the Asbury Park Chamber of Commerce. The Monmouth County Clerk’s Office is located at 33 Mechanic Street in Freehold; the phone number is 732-431-7324 and the email address is Countyclerk@co.monmouth.nj.us. The County’s Veterans Services Office is located at 3000 Kozloski Rd. in Freehold and open from 8:30 a.m. to 4:30 p.m., Monday through Friday. The office phone number is 732-683-8675 or visit the Veterans Services section of the County website at www.VisitMonmouth.com.